French President Emmanuel Macron was subjected to harsh criticism after he had welcomed representatives of the NGO Syria Charity at the Elysee Palace. In an interview with Sputnik France, the Syria Charity President Mohammed Alolaiwy revealed the activists’ “juvenile follies.” Syria Charity, formerly known as “Pour une Syrie Libre” [For a Free Syria], started its journey after hearing reports about the situation in the country. “Indeed, some employees worked on it [spreading information], but later we turned to humanitarian actions, and decided to focus exclusively on the humanitarian sphere. ‘Pour une Syrie Libre’ no longer exists. It was an information group, founded at the very beginning of the developments in 2011-2012, that covered reports under a certain angle; they had their own views,” Alolaiwy said. This was not about support for President Bashar al-Assad, and it explains why Syria Charity only operated in the areas, not controlled by government forces. Alolaiwy told Sputnik that he realized that such activities were politically motivated, and, apparently, regrets these past mistakes. “Do not confuse the vehemence of youth, when we had only started in 2011-2013 with the entity we represent today. Our NGO unites people, who have become professionals. We implement real humanitarian programs, and we want to be an apolitical organization,” he elaborated. Reflecting on the alleged chemical attack in Douma, he said that the activists from his NGO were at the site of the purported incident on April 7. “Two bombs were dropped from aircraft, helicopters. One of them surely contained chlorine, as our employees say, while the other was with another gas, probably, sarin. But our activists claim, it was a derivative substance, which has different effects,” Alolaiwy said. When asked whether the White Helmets and Syria Charity had anything in common, Alolaiwy admitted that his NGO had spread materials, fabricated by the notorious group. 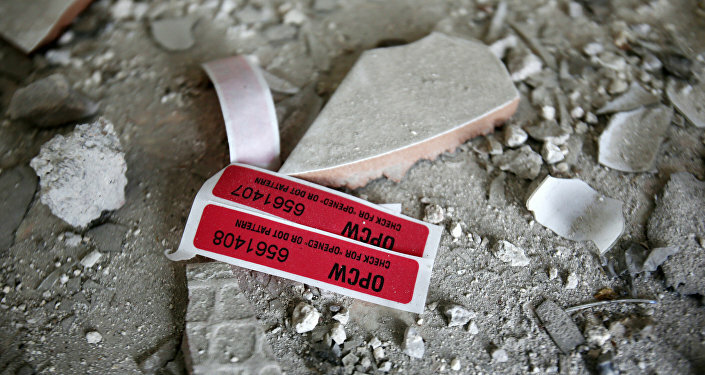 “Almost in 100 percent of cases we publish videos and photos, taken by Syria Charity employees. Sometimes, we publish materials, provided by other organizations, and if we do, we indicate the source. We try to publish verified information, but an information war is underway, and sometimes mistakes may occur,” he went on to say. Meanwhile, former member of the Muslim Brotherhood Mohamed Loizi claimed that in 2005 the head of Syria Charity was spotted with a radical prophet, which, according to him, proved his links to Islamists. Alolaiwy, however, explained that they simply happened to be in the same place at the same time. “They try to label us, but, unfortunately, this label doesn’t suit us. We try to attract everyone, who is interested in the situation in Syria, and we ask artists for help, we organize gala-concerts and events,” he said. Despite the fact that Syria Charity has indeed turned to humanitarian activities, filming and spreading disturbing videos still remains a significant part of its work. While the NGO claims to be apolitical, it presents its footage as the truth about the war in Syria, which under current circumstances, can’t help but have a political implication. “Syria Charity is an NGO that has no links either with armed groups, or political movements, such as the Muslim Brotherhood,” Alolaiwy concluded. The White Helmets, which claim to be an unbiased NGO, rescuing civilians in Syria, has been caught red-handed staging and spreading false videos of their daily operations on numerous occasions. In early April, the group published several clips and photos, showing the aftermath of an alleged use of chemical weapons by government forces in the city of Douma, in Eastern Ghouta. The volunteers filmed people in a hospital, who had allegedly suffered from widespread asphyxiation and had signs of chemical poisoning. The entire video appeared to be staged as several witnesses and participants in the clip revealed the lies behind the footage, saying that people had breathing trouble due to smoke from a bombed out building nearby. While a Syrian boy, who has also been documented in the video, said that someone shouted to go to the hospital, where they poured water on him and put him on a bed with other people to shoot a video. In exchange for his participation in the filming process, the boy received sweets and rice, according to his father.